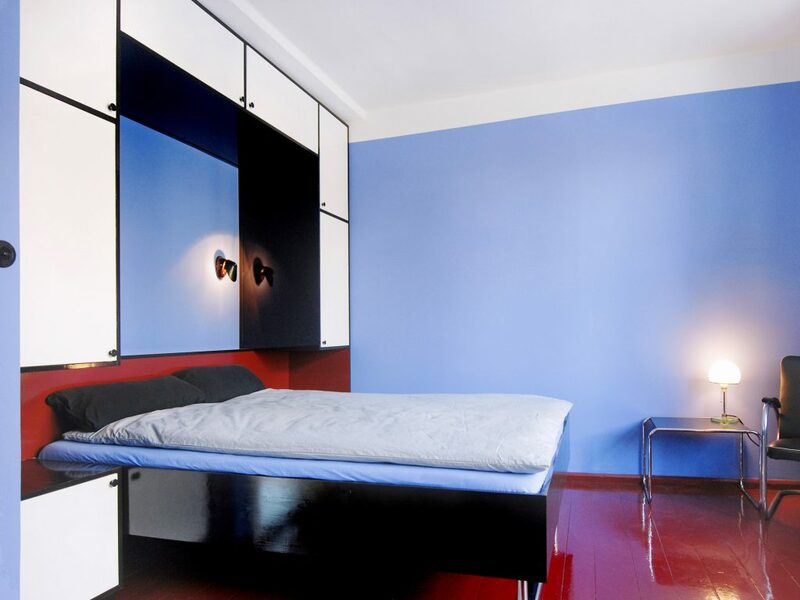 The rentable museum apartment ‘Tautes Heim’ is a project started by landscaping architect Katrin Lesser and graphic designer Ben Buschfeld. 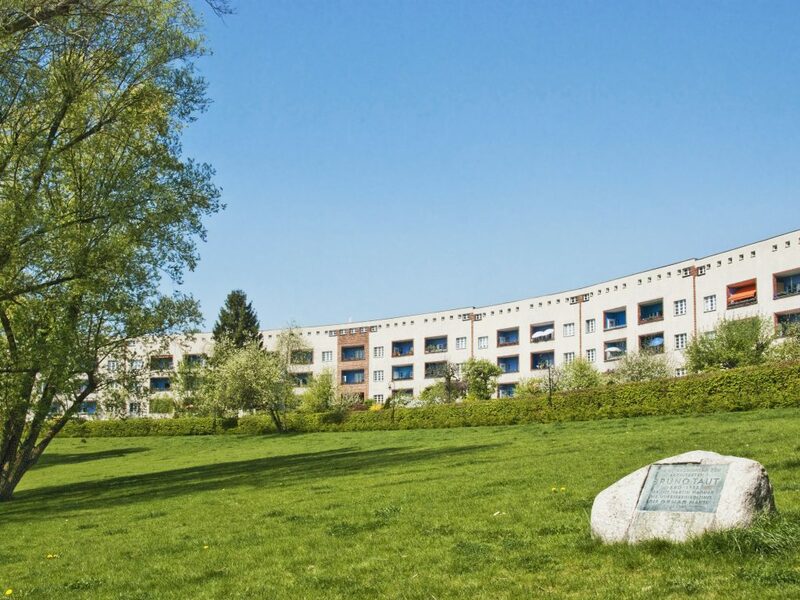 Planned by Bruno Taut it is located in the Unesco World Heritage ‘Hufeisensiedlung’ and won the EU-Prize for Cultural Heritage/Europa-Nostra-Award in 2013. 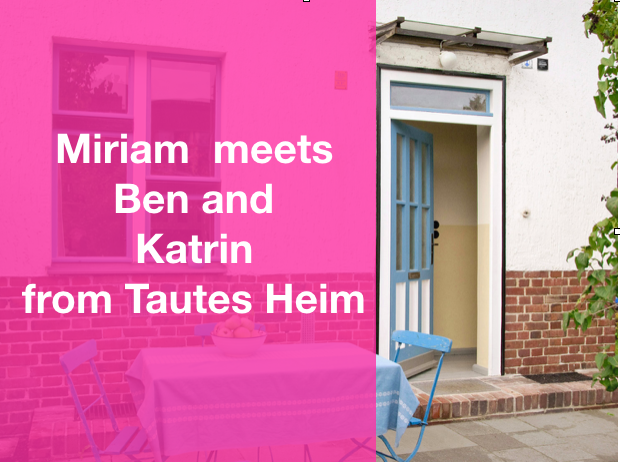 Katrin Lesser and Ben Buschfeld bought the 65 sqm house in 2010 and renovated it with monument conservation guidelines over a period of only two years. 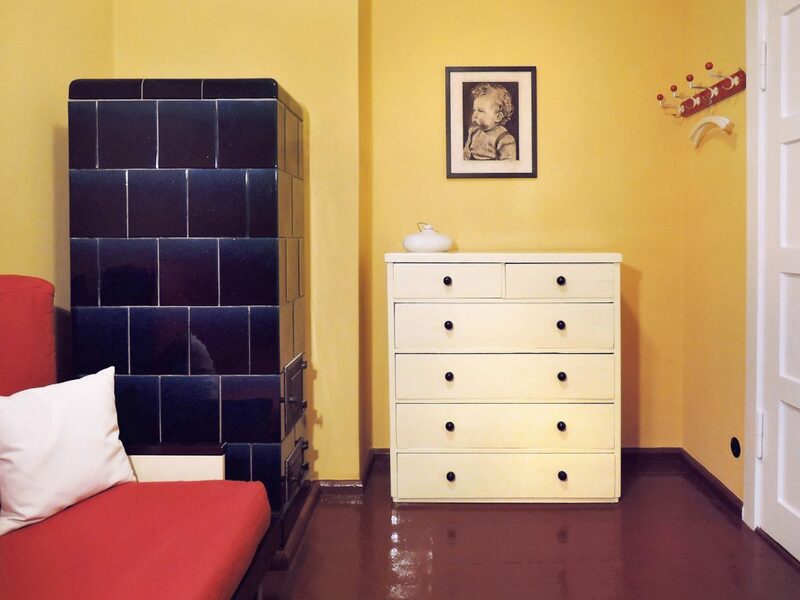 Visitors and architecture fans can rent ‘Tautes Heim’ for an authentic living experience. MB: How does your day start? BB: We are both freelancers and early birds, therefore – fortunately – we need no alarm clock. Our day starts with a relaxed breakfast, shower and a fruit salad but shortly after we start working. MB: Where is the ‘Tautes Heim’ located and how did the idea of it come up? KL: For almost 20 years we have lived in the Hufeisen settlement, just 100 meters away from ‘Tautes Heim’. 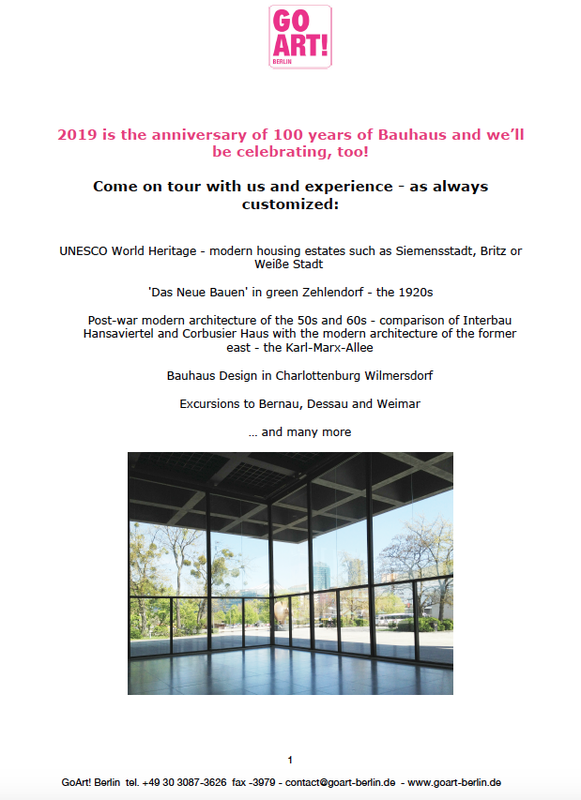 We feel very comfortable here and are both committed to historic preservation, have repeatedly published on the settlement and also offer guided tours ourselves. From my point of view, a guided tour includes visiting the interior. The reason is simple: the high quality of living behind colorful facades can only be experienced from within the building. Back then „light, air and sunshine“ was the slogan of the planners. The new housing should become a contrast to the dark tenement blocks of that time. MB: How did you manage to let a house with world heritage status privately on a daily basis? KL: It has a lot to do with the transformation to individual property in this area, in contrast to other settlements of the “Berliner Moderne”. It makes it more difficult ensuring a homogeniously monument preservation. From this situation we have initiated several projects that pursue a knowledge transfer relating to monuments and at the same time address neighbors, politics and externals. Thankfully we are well connected locally and know many houses of the settlement from the inside. One day we accompanied friends of neighbors during the inspection of an end-terrace house up for sale. The house – formerly inhabited by an old lady – was quite run down and in extreme need of renovation. The friends quickly rejected but we were immediately excited and have been looking for a possibility to make it accessible to third parties since. After having tried to achieve funds unvailingly we came up with the idea of a temporary furnished living space according to museums standard. We took the risk jumping into work and now hope to refinance our private investment through renting. It is fun but also a long idealistic process which was only possible by the experience we bring along. MB: Your are a couple, do you split the responsibilities for this project? I know for example that you Katrin, are a landscaping architect and have caused the Hufeinsen settlement to become a garden monument. And Ben, what role do you play? BB: I am a communication designer with focus on architecture and contemporary history, and so far consider myself to some degree a professional. The whole planning and restoration work is a real ‘couples-project’. Over a period of two years we’ve been working together almost every weekend designing and making choices. Only later we split the work. Katrin has much more competence in garden issues and is also a great site manager. I myself on the other hand was able to demonstrate my PR-skills and took care of the photos, website, networking, etc. MB: Temporary residents and architecture fans can stay overnight and also work at ‘Tautes Heim’. There is a desk and a wifi connection. What about cooking, can I rent the house and invite guests for dinner? KL: Theoretically, yes. 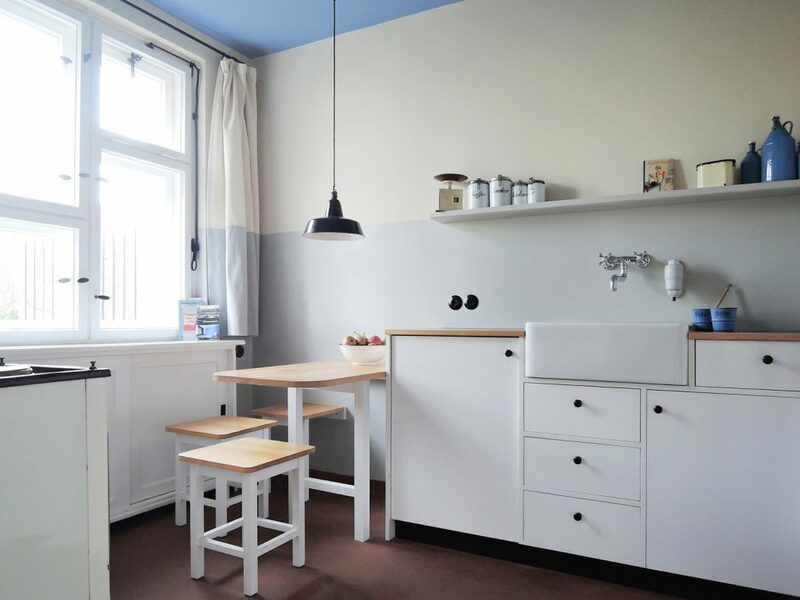 Even though the house is full with originals of the Bauhaus era, simultaneously the kitchen is functionally fully equipped. Modern comfort in the form of a fridge and a dish washer has been achieved by hiding the devices conveniently behind the kitchen front. Also the charming „backofix“ stove does its duty. 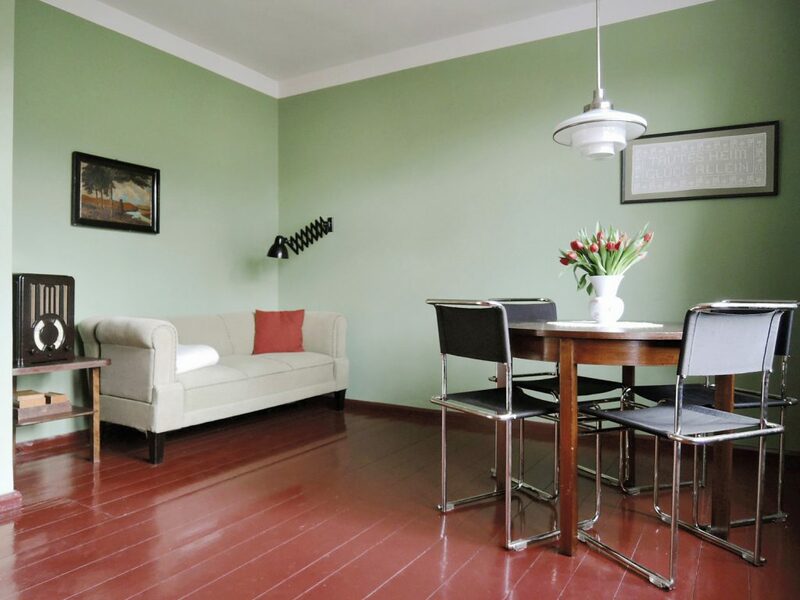 However, it is no high-end equipment and the 65 sqm house is relatively small. Insofar it is not a place for extensive culinary events. Up to four people can be comfortably catered though. 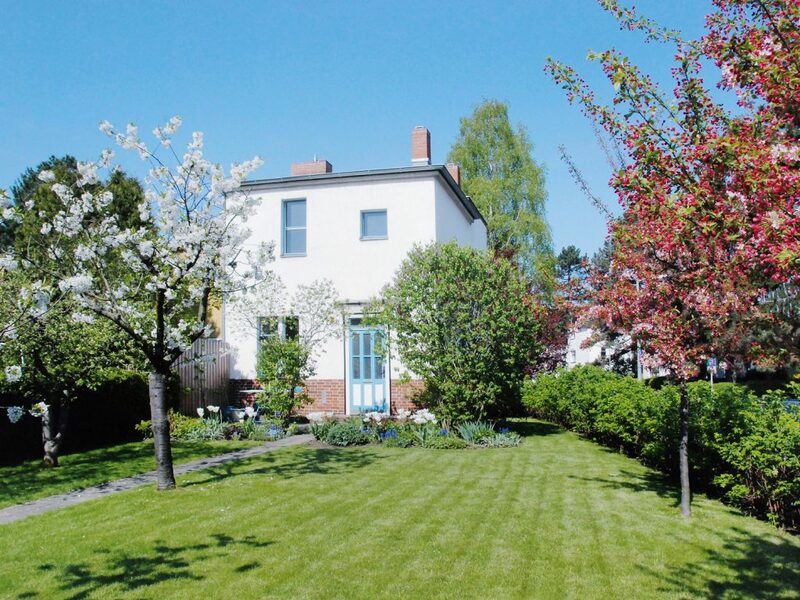 Besides, in spring and summer you can enjoy sitting outside on the terrace in front of the house. MB: How does your day end, do you enjoy cooking? BB: Yes, I love cooking – more than Katrin actually. But we eat and cook regularly, consciously and healthy – not only for us, but also for our friends and guests. This however takes time of which we lack a bit of these days. BB: This weekend, we are invited to a birthday of a friend and are supposed to contribute something to the buffet. I think we will prepare a mousse auch chocolat and an exotic asian salat – both not typical meals of the 1920ies though. Regina Maria Möllers’ exhibition ‚The Moth’ runs until November 17, 2018 at Janssen Gallery Berlin. Born in Munich Möller firstly took up her studies at the Philosophical Faculty of Ludwig Maximilians University. She spent a large part of her career as a professor/visiting professor as well as artist (since 1993) amongst others in New York, Stockholm, at the NTNU Trondheim, Singapore as well as MIT in Cambridge. Today she lives in Berlin. With ongoing and often interdisciplinary projects such as ‚regina’ or ‚embodiment’ Möller focuses on socially relevant topics that partly autobiographical. She consistently works at the interface between culture and everyday life. 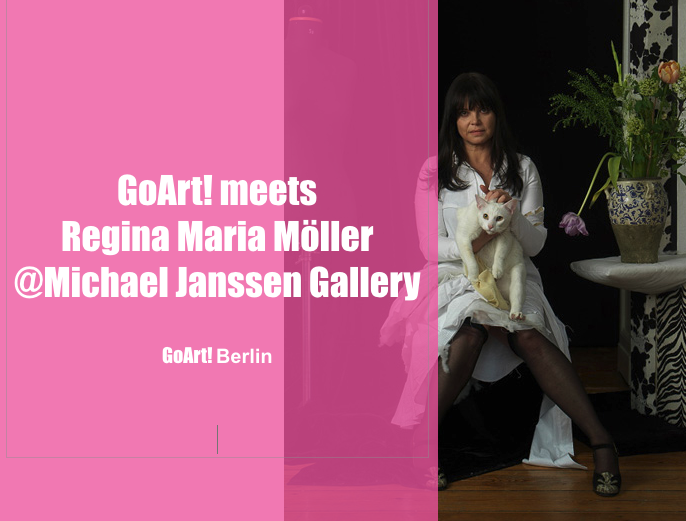 GoArt! meets Regina Maria Möller. MB: Regina, how does your day start? RMM: When I am in Berlin I usually go to the SSE – I swim. MB: At first glance, the gallery showcase is covered with a heavy black curtain. Entering the front space the visitor is confronted with a stage-like set of historical theatre curtains. Only after passing through does he reach the props warehouse, which is in the backspace of the gallery, exhibiting more of your works. 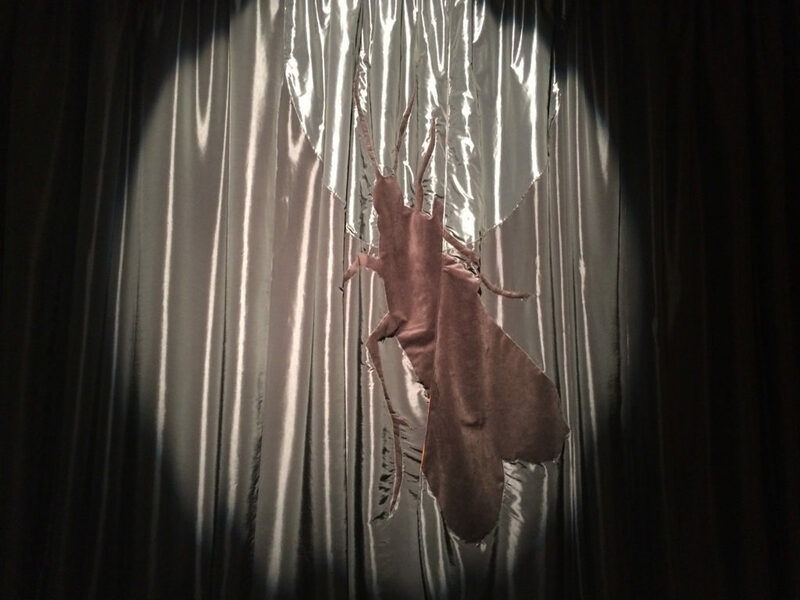 Consequently, it becomes an indirect stage direction for the viewer – what role does the moth play in this production? 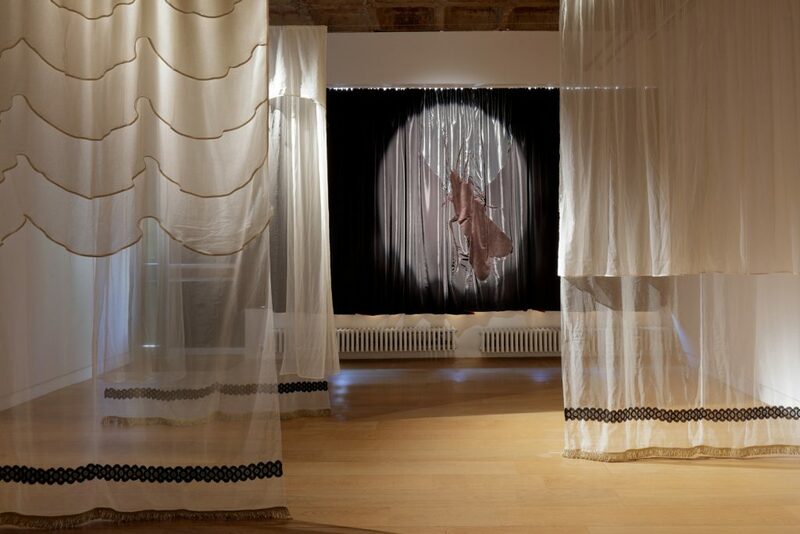 RMM: During the exhibition visitors pass the gallery through the main curtain and thus become participants. There is a shadow play in the center of the “stage” and by moving the curtains it reveals a new perspective to the viewer. Dramaturgy and orientation move circular – similar to the behavior of moths orbiting round the light while simultaneously being attracted by darkness. In this case I am referring to the ‘clothes moth’. An unwelcome visitor in our wardrobes, but at the same time it is a quality guarantee in digitally and plastic dominated ages: their larvae live on keratin, a protein that is a component of an animals fur and horn. Therefore fibres of high quality like wool and silk are a desirable resource for larvae. Generally speaking, a heavy theatre curtain is often associated with something dusty in which thousands of moths larvae are romping about. It is penetrated, eaten and if it is not conserved in a theatrical prop it consequently lands in an old stuff bag. Moreover, the fabulous creature ‘The Mothman’ is an allegory for the Grim Reaper and so do the clothes moths remind of the Ephemeral. For me, this is a memento mori to our senses and to material as a tangible body. 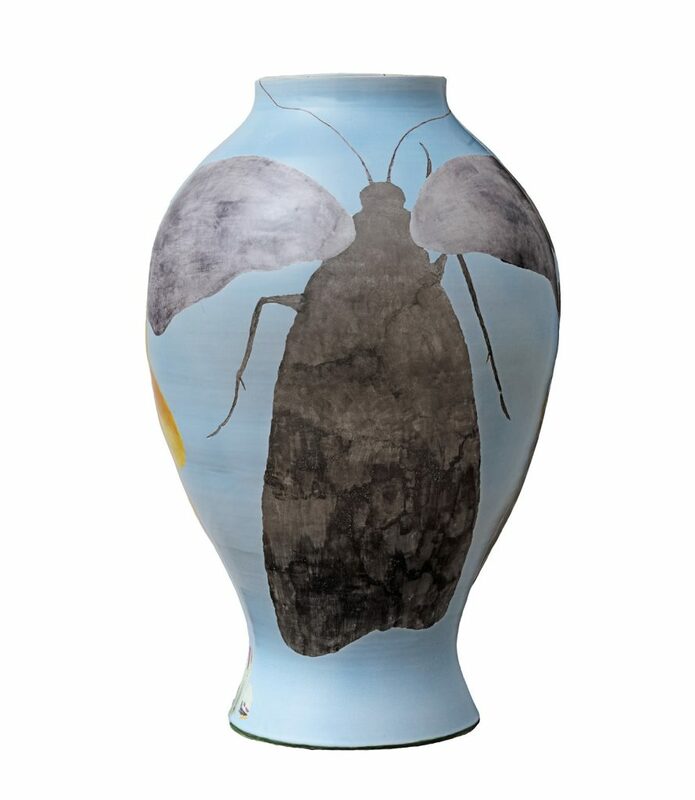 In addition, the porcelain vases come into play: For the first time they are endowed with a moth motif and produced together with Uli Aigner One Million as well as with the porcelain manufacturer Nymphenburg. Handcraft and porcelain production have taken on a new significance in our technological world. All the more I love its delicacy and imperfection. Like so many materials I work with porcelain has its own character – a life – that provides surprises. So does the moth. MB: Originally, you have a theoretical background, and among others studied art history. 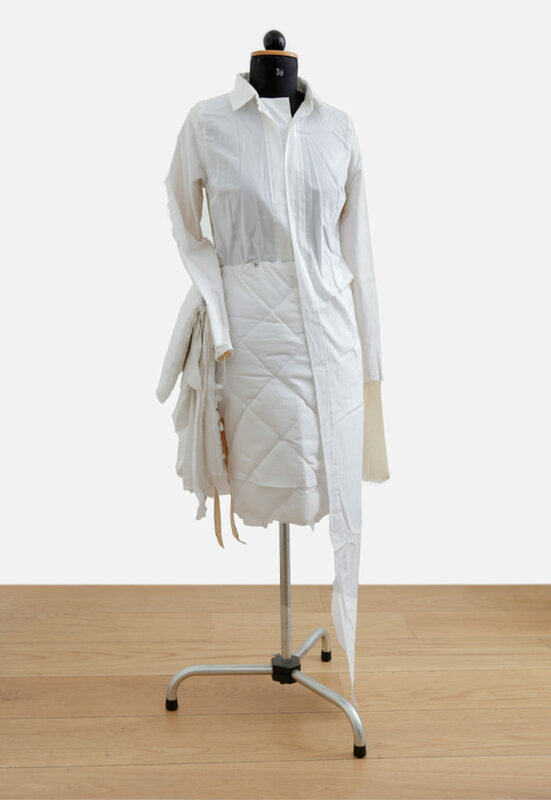 1994 you also emerged as an artist with works like the magazine ‘regina’ and the label ‘embodiment’ – designing dresses, wallpapers and furniture as well as art works. Noticeable are the biographical components, for example, ‘Reproduktionen’ or other photo works, even the robes in it function as requisites. Do you place yourself in the genre of the self-portraying artist? RMM: Generally, I do not consider myself an art piece and do not stage myself as an artist. But as an author, an artist, I naturally identify with my works and in this sense each piece leaves an imprint, an image of myself. 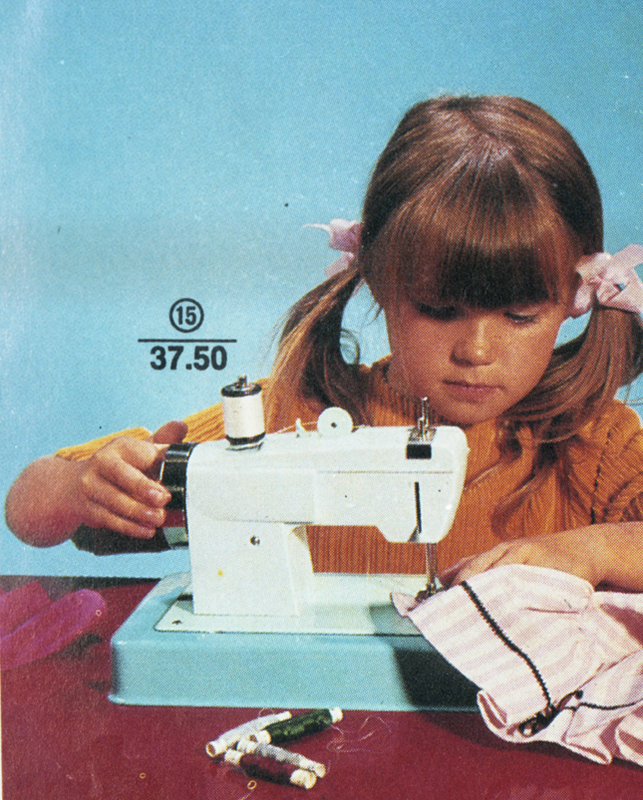 On the one hand important issues of ‘regina’ and ’embodiment’ is the question of identities showing themselves in everyday life – intercultural and medial – for example via ‘clothing’ (dresses, textiles, interieur). But also the attribution and penetration of role models are of particular relevance. In our fast pace digital age people use multiple identities. Like this biographies become a mirror of a entertainment society. Nevertheless ‘regina’ and ‘embodiment’ go back to the 90ies where these issues were still quite different. Today they have a new relevance – their physical (embodiment) and analogue (regina) presence. MB: To me, objects in the show awaken protagonists of the cultural life like the Brechtian curtain, a time travel through different epochs and genre. Is the moth synonym for a pioneering spirit of researchers, for artists, even for you, in your artistic context? RMM: No. But it is part of it. MB: Besides, a topic that interests me a lot is food – also part of ‘regina’ -of course in a vital way. The social importance of food, of nutrition, up to recipes. What place does food/cooking have in your artistic context? RMM: Re-educating our senses and sensors. 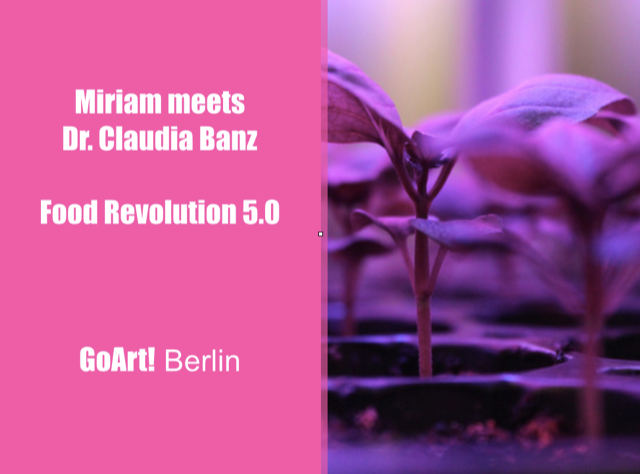 The museum of Decorative Art in Berlin has openend the by Dr. Claudia Banz curated show Food Revolution 5.0 on May 18, 2018. Themes such as food in the future, dwindling resources or climate change make nutrition to a hot political issue. 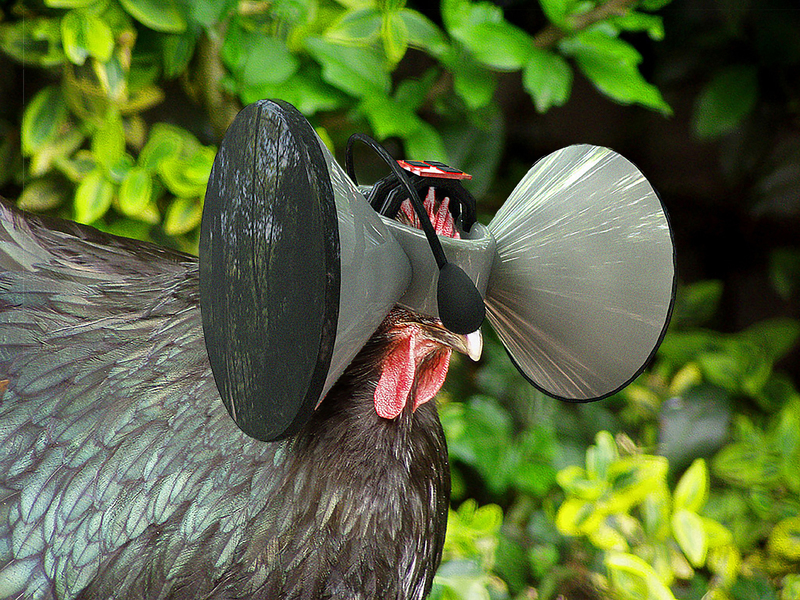 What scenarios develop artists for the food of tomorrow? 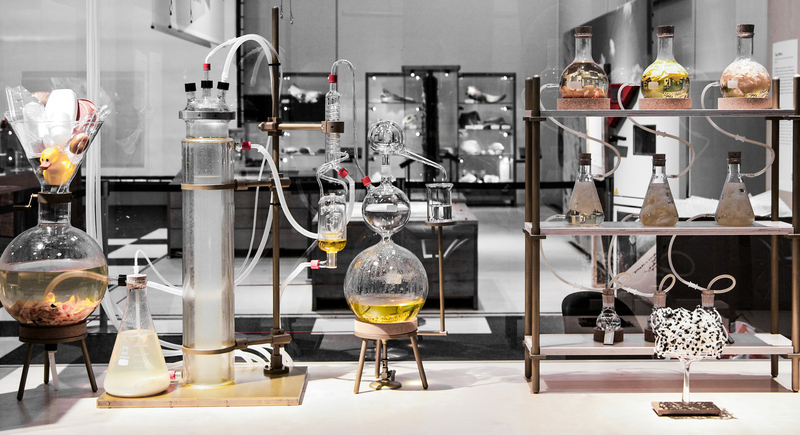 Miriam Bers met the curator of Food Revolution 5.0 and the Museum for Decorative Arts. MB: Food Revolution 5.0 has already been shown at the Museum für Kunst und Gewerbe in Hamburg. There, the participating artists had developed commissioned works. Will you exhibit the same pieces in Berlin? CB: Yes, more or less but we could enlarge the show by other new important contributions. So also an exhibition is an open project. In Berlin, we work much more in the outer space. In the ‘Piazzetta’ comes an “Urbane Streuobstwiese” (urban meadow orchard) into being, a project of the Dutch city planner and designer Ton Matton. On an up to now unused terrace of the museum the Planwerkstatt of the Technical University of Berlin in cooperation with the landscape architect Katrin Bohn realizes “Essbare Gärten” (eatable gardens). Particularly for this exhibition Silke Riechert has developed the participative installation ”Störung im Schlaraffenland” (disruption in paradise), a critical look at the food industry but at the same time a nutritional knowledge transfer for school children. Susanna Soares and Andrew Folkes show their project “Insects au Gratin”, here researching future food in the context of insects, nutrients and 3 D prints. 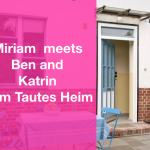 Chmara.rosinske participate with their work “Mobile Gastfreundschaften” (mobile hospitalities) and the Center for Genomic Gastronomy present their latest project “ To flavor our teares”. MB: Food is more and more important and in our western world and became a prior lifestyle topic. Thus, it has lots of exciting societal and aesthetical components, health aspects, then again ecological and political meaning and its downside: lack of food, disappearance of resources and famine. 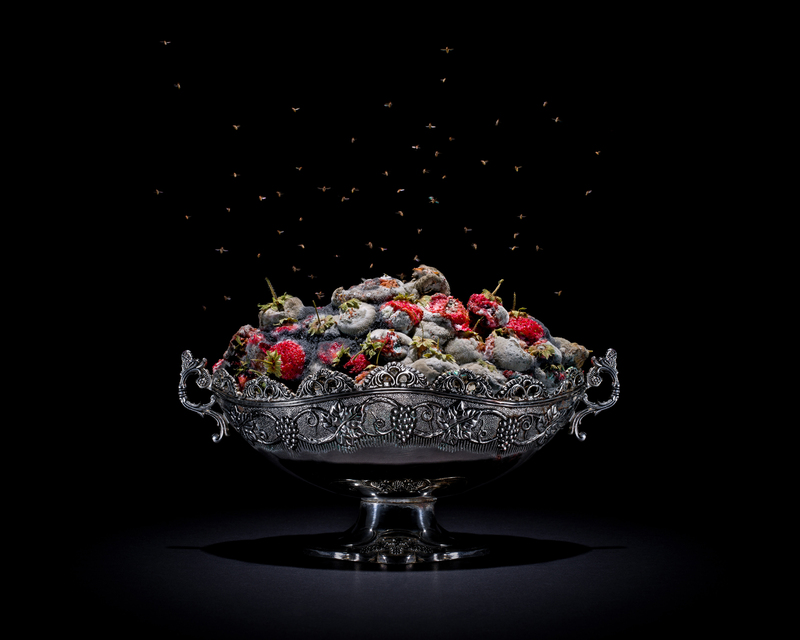 The Austrian Klaus Pichler for example works in a critical and at the same time very aesthetical way on the subject ‘food in abundance’. According to statistics, about one third of the worldwide foodstuffs are discarded. Most of it in industrialized countries. In contrast, 925 Million people are threatened by hunger. What is the message of the exhibition, does it offer alternatives? CB: Yes, this subject plays a major role in the work of Pichler, as well as in the ones of Kosuke Araki, who designs plates and dishes by food waste, thereby demonstrating that it can be a valuable resource. Our consumption is so important, the respectful treatment of resources. Subtext of most of the works is consumption as a question of attitude and responsibility. MB: What are you referring to with the title Food Revolution 5.0? 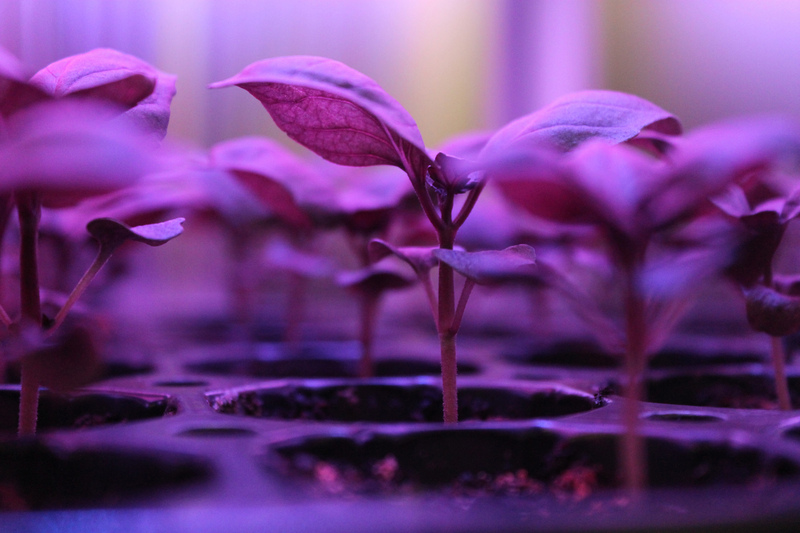 How is your vision for future food? CB: The title resulted by beforehand researches: I think in the meantime it has arrived in the center of society that our nutrition system is the main cause of the climate change and that it needs to be changed radically. 5.0 stands for a wise use of technology, connected with traditional cultural techniques and agriculture, handcraft knowledge and DIY, preserving and further specifics of farming. At the same time it stands for degrowth and the idea of commons. The earth’s resources belong to all humans and not only to a few large companies. Accordingly, all men shall have equal access to it. MB: Are the designers’ works applicable or rather reflections and utopia of future food? CB: We show best practice examples like an indoor farm growing salad or a mobile beehive for the urban space from the ‘Beecollective’. You will also see a tomato-fish project operating according to the principle of an aquaponic, and a seaweed farm for the building façade. 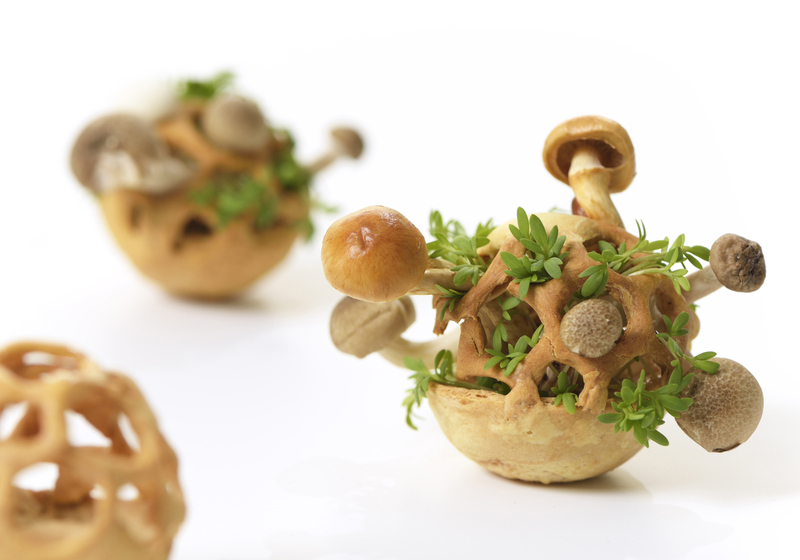 But there are also speculative works such as “Digital Food” from Martí Guixé creating a vision of a customized nutrition. On the other side Johanna Schmeer with her piece “Bioplastic Phantastic” studying possibilities to use bio– and nanotechnological knowledge for the future food production. MB: Would you tell us something about the concepts of Werner Aisslingers or Marije Vogelzang, what is the Sharing Dinner? 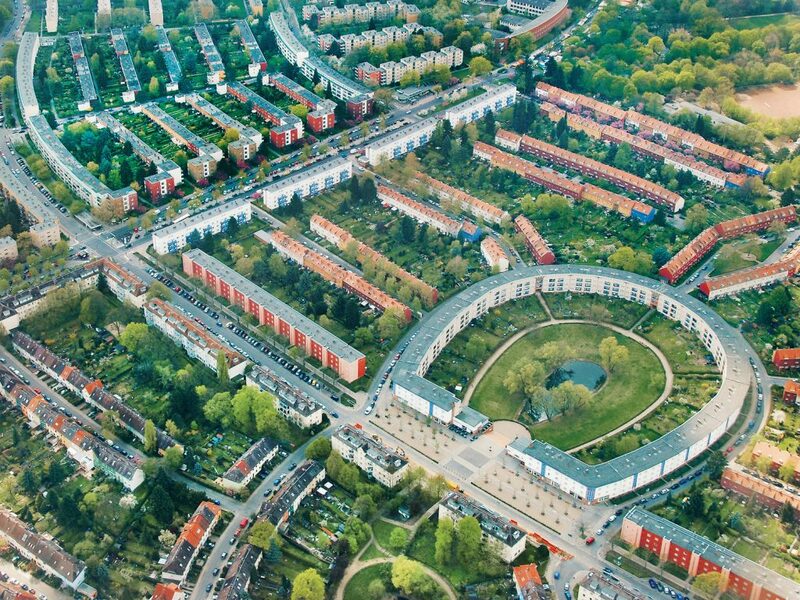 CB: Especially for this project Werner Aisslinger developed a communal cooking landscape. It is a hybrid of an archetype hob, arena/steps functioning as a symbiosis of analogue cooking and social aspect of a shared cooking, eating and communication. 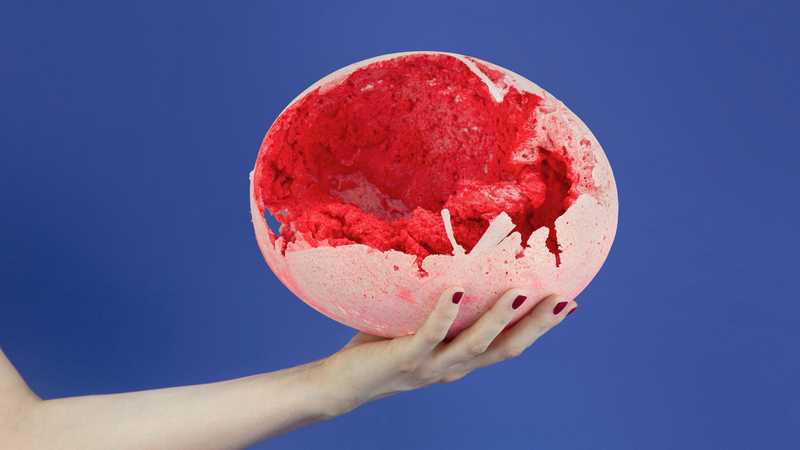 Marije Vogelzang in “Volumes” presents a possibility to change our eating habits positively. MB: Berlin is a good example for a city, where creative minds deal with the issue sustainability. 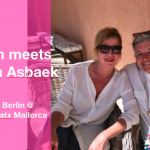 Successful urban gardening projects, an increasing number of restaurants and chefs cooking with local ingredients, organic supermarkets, the Berliner Tafel, distributing foodstuffs to deprived persons and last but not least inhouse farming/vertical planting. How do you see this development, do we have a lead role? CB: yes, absolutely. There is an unbelievable density of different players dealing with the food subject and an interesting start up scene for innovative and sustainable food products and its useful distribution. Besides, Berlin is the first city having a Nutrition Council, based on the Anglo-Saxon model. This is important to create awareness in politics. And there are also lots of exciting art and design projects being seen by an international audience. Berlins art- and design universities deal with this issue. MB: Do you like cooking, which are your criteria? CB: I like cooking and in the meantime check out where products come from. Local and regional ones are very important for me. I go shopping more frequently to reduce my food waste. It is a pity that there are still few stores offering food without packaging – even organic supermarkets use as much as the others. CB: in the meantime, there are also recipe books for insects, within others from the Suisse designer Andrea Staudacher, participating in the show as well. I would spend more time with insects used as food and try different recipes not least due to the new European law permitting insects as aliments. 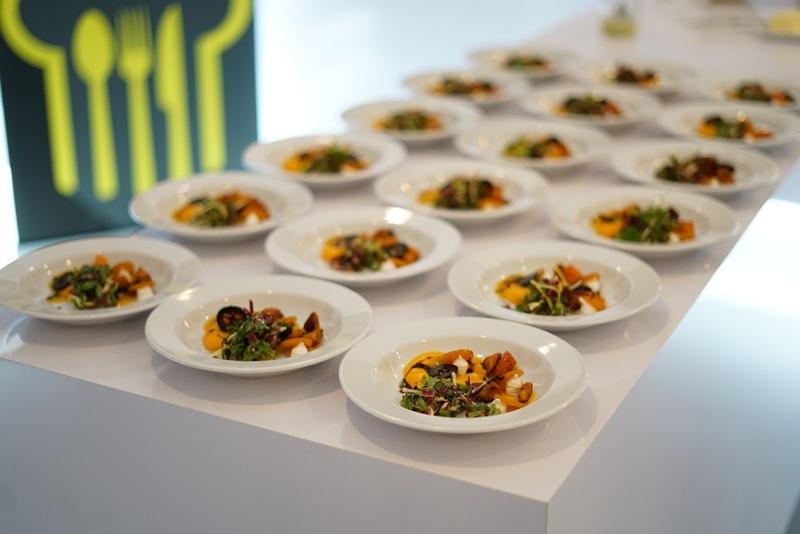 In 2018 the Berlin food festival eat! berlin takes place for the seventh time. The annually edition is one of the culinary highlights of the capital involving 50 events with more than 60 chefs in the best restaurants adding up to 30 Michelin stars and 496 points in Gault&Millau. The luxury travel and lifestyle magazine Travelers’ World has honored the 2016 festival as one of the best 10 food festivals in the world. 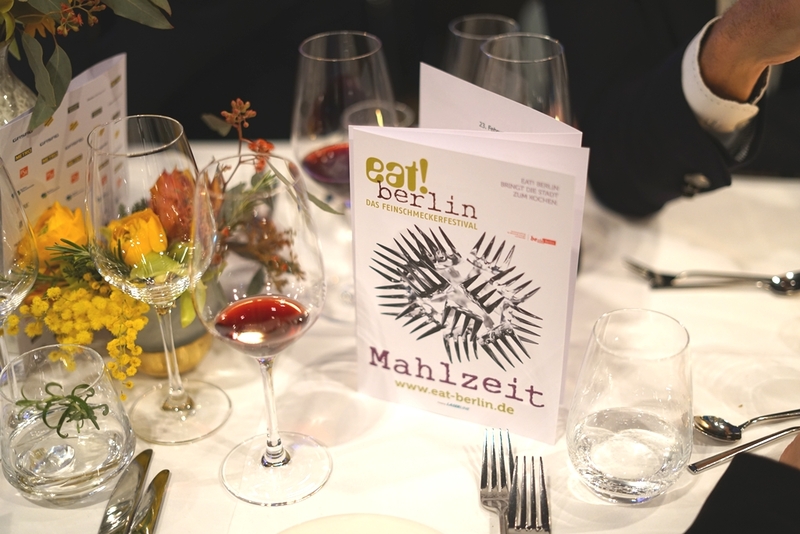 Tasty collaborations such as the Tipi at the Chancellery or Frau Luna and renowned chefs like Tim Raue or Sebastian Frank are among the highlights of eat! Berlin. 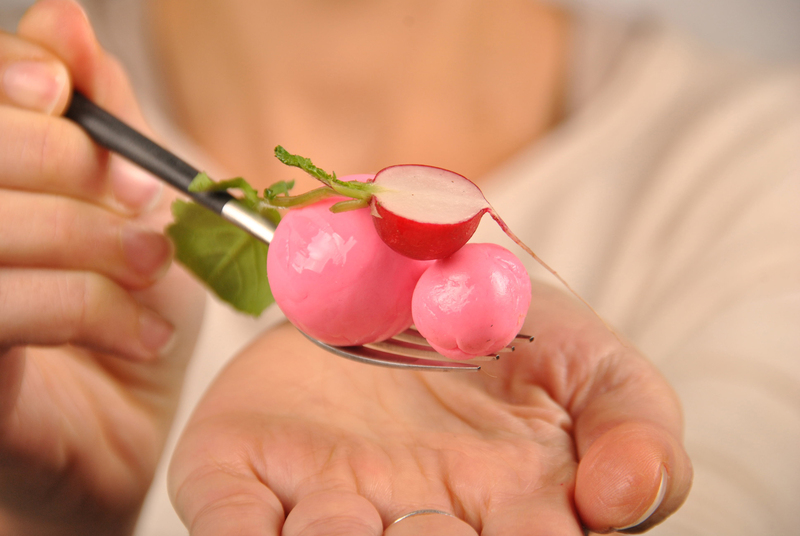 Miriam Bers talked to the founder of the Berlin food festival, Bernhard Moser. MB: What was your motivation to launch the Berlin food festival in 2011 and why eating? BM: I come from a village in Austria. There were only two career options: agriculture or gastronomy. Since we did not have a farm, I became a cook/waiter, then went on to become a certified sommelier. So I gradually discovered the pleasure for me. The motivation to found the festival originates from the fact that I have always seen Berlin as a gourmet metropolis although back then it has often been perceived as a Currywurst stall. To me and many of my friends who are top chefs, this was really annoying. One evening we sat down together – including the owner of the Mattheis advertising agency and a well-known journalist – and came up with the idea of eat! Berlin. MB: What are the selection criteria for participating in eat! berlin? BM: I enjoy working with outstanding chefs and restaurateurs. Thereby I am guided by my own experiences at Gault&Millau. Ideally, the restaurant we work with has at least 15 points and stands for something. So no 08/15 restaurant but an outstanding position in the catering industry. Since we work very closely with the people during the festival, the personal relationship is also important – so it’s always good to recognize the egomaniacs in advance. MB: Can we speak of culinary trends or food fashion? BM: Yes, but we try to avoid it. Good food and drinks are our trend, but we are not interested in things like “superfood” and similar humbug. MB: What role does sustainability play for chefs? BM: For us, sustainability plays a significant role, for the chefs an increasing one. Ideally, the gourmet does not only enjoy, he also takes responsibility for his consumption. Regional food, e-mobility etc. are enormously important to us. In addition, we are the only gourmet festival in the world that is supplied exclusively with tap water. MB: What are the Berlin food festival highlights this year, what’s new? BM: Almost everything is new because I am not fund of repetitions. For me the development of the program is of high importance, so I cannot name any highlights. I am a fan of the entire program and look forward to every single event. MB: How many visitors are you expecting this year and can you say that the Berlin food festival is attracting international audiences? 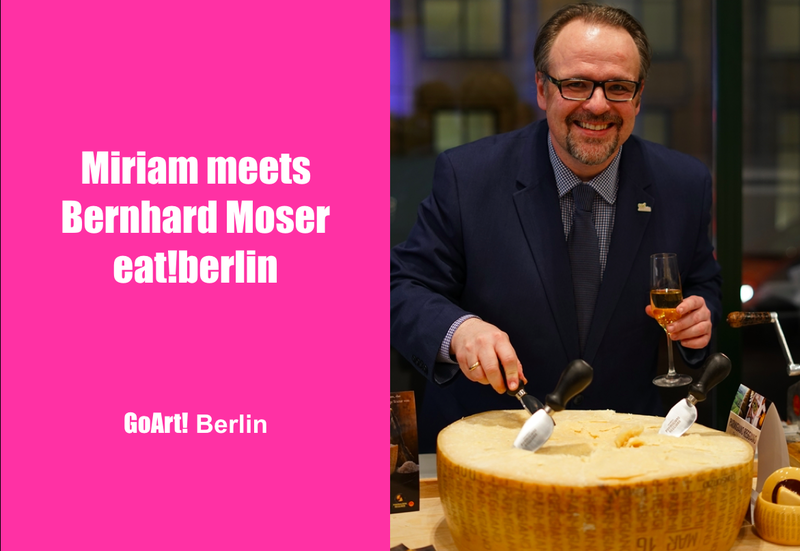 BM: We will have about 7,000 visitors this year, I don’t have exact numbers since some events are without rsvp such as the “Berliner Käsetage” (Berlin Cheese Days), so we can only estimate the number of visitors. Hence it could also be 9,000. Anyway, when I was there today, it was very busy. Internationally, we have been receiving a lot of attention, especially since the nomination as one of the 10 best food festivals in the world. That’s good, because only in this way we change the image of our capital. We are not just a party city. MB: What is your favorite place in Berlin? BM: I cannot name my favorite gastronomy spot but apart from this my favorite place is on the couch watching cartoons with my daughter. BM: I really want to visit Heston Blumenthal’s “The Fat Duck” in 2019. MB: Do you cook privately? BM: I am only allowed to cook when we have guests at home. Chefs cook differently, we need too many pots and always make a mess – that causes trouble. BM: Take a waxy boiled organic egg with a blob of sour cream and add Malossol caviar as much as you want. But please use caviar from good farms in your area. I appreciate the Brandenburg caviar from the trout and sturgeon farm Rottstock, operated by Susanne and Matthias Engels. Enjoyment often only needs three components. 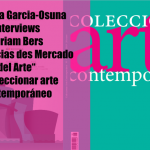 Coleccionar Arte Contemporáneo in conversation with GoArt!